But, professional bakers probably think about these things, too, from time to time. You can’t tell me Peter Reinhart hasn’t had a few floppy baguettes or soggy bagels in his time, or that every loaf of bread that emerges from Rose Levy Beranbaum’s oven is absolutely perfect (Oh, who am I kidding? It probably is). I’m just keeping it real here, friends. Sometimes, I just need to go back to the basics. And this archived post, one of my favorites that I wrote for Tablespoon, was the first thing that popped into my head when I decided I needed a refresher course. So, I’d thought I’d share it with you, too. 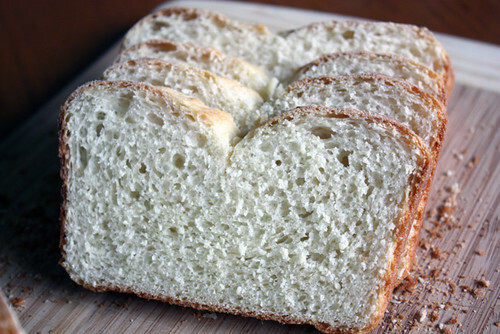 Take a gander over there to learn some Bread 101 and bake yourself one seriously awesome basic white bread. It’ll change your life. What would you like to see baked and blogged on Girl Versus Dough? I’m game for anything, folks — difficult, easy, sweet, savory, creative, boring, weird, whatever. Let’s do this. Sour dough. I’ve been trying to make my own damn starter for some time and have yet to achieve any luck. So it would be nice to see if you could come up with a step by step guide on getting a sour dough starter going, and of course, baking a sour dough loaf at the end of the day. Also interesting no-knead doughs would be good, I make a no-knead bread currently but its pretty boring after a while. Yum. This loaf looks scrumptious. I’ve been wanting to try sour dough for some time now too. Although you could put any bread in front of my face and I’d eat it up. Pirom and Russell — Yes! Sourdough is on the docket, for sure. Hi! 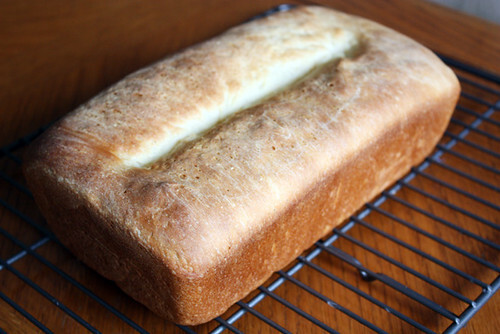 I was wondering if you could make this bread without the loaf pan, and if you’d need to make any adjustments when cooking? I’m a college kid and I left my pan at home . . .
Amy — You can definitely bake this as a free-form loaf on a parchment paper-lined baking sheet. Just shape it into a ball, making sure the top of it is taut by tucking the edges under the loaf. Then slash a shallow ‘X’ on top of the loaf right before baking and you should be set! Everything else should follow the same instructions. Good luck! Ohh I can’t wait for sourdough, I’ve been wanting to make it but haven’t figured out where to start. Hope it’s soon! Hi! It’s me again and I just wanted to thank you for your response. It worked like a charm on the baking sheet (but it’s still better with a real pan, haha). In the year since, I’ve made this loaf dozens of times! It’s fantastic!